Topic for the 8/28 #storyappchat: Testing, Testing, Testing! Before you send your new creation out into the world, how do you make sure it’s ready? In the world of print publishing, you share it with the members of a good critique group, listen to/evaluate their comments, then revise, rewrite, redraw, repeat (a process that can take quite a while). In the software development realm, programs can be in pre-release versions for months or years before being ready for consumers. In the much faster-paced world of app publishing, what works for you when getting your storybook app ready for the App Store or Android Market? Come share your best practices for creative vetting, glitch and bug removal and pre-release testing on Sunday night (August 28) at 9:00 p.m. Eastern! 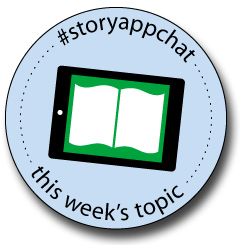 Use the Twitter hashtag #storyappchat–and we’ll see you there! @lynleystace: As app consumer I’ll be honest: a star rating from 3 to 5 stars isn’t as honest as the whole range. @RuckusMedia: The more commercial apps are not so easy to garner reviews. You have to find your audience. @iPad_storytime: My biggest piece of advice … reviewers are busy, but parent reviewers are esp. busy in summer w/school out, be patient w/us. @the1stdaughter: Besides, how do U grow, if everything U ever hear is positive? Constructive criticism is perfect. If you missed this one, feel free to peruse the 29 pages in the transcript above, and plan to join us THIS Sunday night at 9:00 p.m. Eastern for the next #storyappchat! Review sites are becoming increasingly important vehicles for getting the word out about a new app. Our own Digital Storytime is an excellent example, but there are more and more of these popping up across the blogosphere and beyond. Bring your list of favorite review sites to this Sunday’s #storyappchat, and we’ll compile a list of the most useful/helpful ones right here on the blog. See you at 9:00 p.m. (Eastern) tomorrow night (August 21)! We had some visitors from the classroom during last night’s #storyappchat, which made for an energizing and inspiring discussion. If you missed it, feel free to peruse the transcript above and be sure to stop by THIS Sunday night (August 14) at 9:00 p.m., when we’ll enjoy special guest @Kwiksher who will be on hand to talk about their app-building tool. Kwik is a Photoshop plug-in that allows you to turn your Photoshop files into interactive mobile apps. Kwik also requires the Corona SDK, and is a truly do-it-yourself solution. They are on the verge of launching officially and we look forward to having them answer questions this week during #storyappchat. Read more about Kwik on their FAQ page. Don’t miss this Sunday’s chat–see you then! Ever thought about the world of apps in relationship to other (non-story) books for kids? Although not yet as popular as storybook apps, the non-fiction book is popping up more and more often in the App Store. Recent examples include Spot the Dot by David A. Carter/Ruckus Media, Dandelions by R.A. Mildren and Our Choice by Al Gore. As exciting as the app format can be for fiction stories, it also offers a wealth of new opportunities for non-fiction books. Let’s chat about the possibilities for creators, developers and consumers of these non-storybook apps THIS Sunday, August 7, 2011 at 9:00 p.m. Eastern. P.S. New to Twitter chats? Check out this fantastic cheat sheet from Debbie Ohi to get you started. Several of us use either TweetDeck or TweetChat to manage the discussion–you may find these tools useful as well. See you then!